Expanding ones business is high on the agenda for any owner of a Private Hire firm who has the ambition to succeed. However, it is the owners who go that extra mile that separate them from the rest. Of course almost every firm is trying to expand but why should drivers choose your firm over the competition? There are many reasons for this which include, and most importantly, being able to provide them with a regular stream of work, a well organised and structured enterprise with the user-friendly facilities to operate efficiently and effectively. 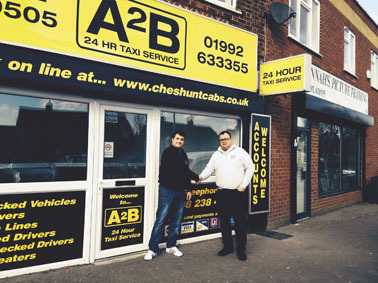 To do so, requires the right system, and according to David Jones (Owner of A2B Taxi Service in Cheshunt) that system comes in the form of Autocab. …We are very happy with Autocab. The drivers are happy with the system and the work that they receive from it. They find the Omicron data terminals easy to operate. They can even check the flight details which is a big plus for them.